This article is about the Paddington district in London. For other uses, see Paddington (disambiguation). Paddington is an area within the City of Westminster, in central London. 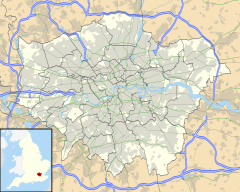 First a medieval parish then a metropolitan borough, it was integrated with Westminster and Greater London in 1965. Three important landmarks of the district are Paddington station, designed by the celebrated engineer Isambard Kingdom Brunel and opened in 1847; St Mary's Hospital; and Paddington Green Police Station (the most important high-security police station in the United Kingdom). A major project called Paddington Waterside aims to regenerate former railway and canal land between 1998 and 2018, and the area is seeing many new developments. Offshoot districts (historically within Paddington) are Maida Vale, Westbourne and Bayswater including Lancaster Gate. The earliest extant references to Padington, historically a part of Middlesex, appear in documentation of purported 10th-century land grants to the monks of Westminster by Edgar the Peaceful as confirmed by Archbishop Dunstan. However, the documents' provenance is much later and likely to have been forged after the 1066 Norman conquest. There is no mention of the place (or Westbourne or Knightsbridge) in the Domesday Book of 1086. It has been reasonably speculated that a Saxon settlement was located around the intersection of the northern and western Roman roads, corresponding with the Edgware Road (Watling Street) and the Harrow and Uxbridge Roads. A more reliable 12th-century document cited by the cleric Isaac Maddox (1697–1759) establishes that part of the land was held by brothers "Richard and William de Padinton". In the later Elizabethan and early Stuart era, the rectory, manor and associated estate houses were occupied by the Small (or Smale) family. Nicholas Small was a clothworker who was sufficiently well connected to have Holbein paint a portrait of his wife, Jane Small. Nicholas died in 1565 and his wife married again, to Nicholas Parkinson of Paddington who became master of the Clothworker's company. Jane Small continued to live in Paddington after her second husband's death, and her manor house was big enough to have been let to Sir John Popham, the attorney general, in the 1580s. They let the building that became in this time Blowers Inn. As the regional population grew in the 17th century, Paddington's ancient Hundred of Ossulstone was split into divisions; Holborn Division replaced the hundred for most administrative purposes. By 1773, a contemporary historian felt and wrote that "London may now be said to include two cities, one borough and forty six antient [ancient] villages [among which]... Paddington and [adjoining] Marybone (Marylebone)." In the 19th century the part of the parish most sandwiched between Edgware Road and Westbourne Terrace, Gloucester Terrace and Craven Hill, bounded to the south by Bayswater Road, was known as Tyburnia. The district formed the centrepiece of an 1824 masterplan by Samuel Pepys Cockerell to redevelop the Tyburn Estate (historic lands of the Bishop of London) into a residential area to rival Belgravia. Derivation of the name is uncertain. Speculative explanations include Padre-ing-tun (father's meadow village), Pad-ing-tun (pack-horse meadow village), and Pæding-tun (village of the race of Pæd) the last being the cited suggestion of the Victorian Anglo-Saxon scholar John Mitchell Kemble. There is another Paddington in Surrey, recorded in the Domesday Book as "Padendene" and possibly associated with the same ancient family. A lord named Padda is named in the Domesday Book, associated with Brampton, Suffolk. An 18th-century dictionary gives "Paddington Fair Day. An execution day, Tyburn being in the parish or neighbourhood of Paddington. To dance the Paddington frisk ; to be hanged." Public executions were abolished in England in 1868. The Paddington district is centred around Paddington railway station. The conventional recognised boundary of the district is much smaller than the longstanding pre-mid-19th century parish. That parish was virtually equal to the borough abolished in 1965. It is divided from a northern offshoot Maida Vale by the Regent's Canal; its overlap is the artisan and touristic neighbourhood of Little Venice. In the east of the district around Paddington Green it remains divided from Marylebone by Edgware Road (as commonly heard in spoken form, the Edgware Road). In the south west it is bounded by its south and western offshoot Bayswater. A final offshoot, Westbourne, rises to the north west. A lagoon created in the 1810s at the convergence of the Paddington Arm of the Grand Union Canal, the Regent's Canal and the Paddington Basin. It is an important focal point of the Little Venice area. It is reputedly named after Robert Browning, the poet. More recently known as the "Little Venice Lagoon" it contains a small islet known as Browning's Island. 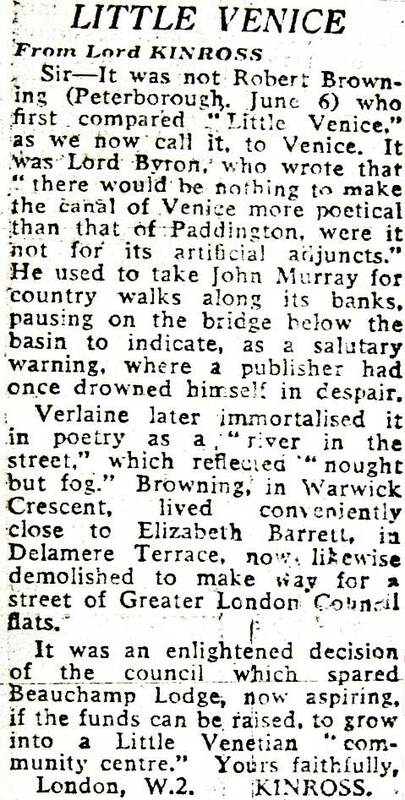 Although Browning was thought to have coined the name "Little Venice" for this spot there are strong arguments Lord Byron was responsible. Paddington station is the iconic landmark associated with the area. In the station are statues of its designer, Isambard Kingdom Brunel, and the children's fiction character Paddington Bear. The terminus of the Paddington Arm of the Grand Union Canal was originally known as the Paddington Basin and all the land to the south was developed into housing and commercial property and titled The Grand Junction Estate. The majority of the housing was bounded by Praed Street, Sussex Gardens, Edgware Road and Norfolk Place. Land and buildings not used for the canal undertaking remained after 1929 with the renamed Grand Junction Company, which functioned as a property company. While retaining its own name, it was taken over in 1972 by the Amalgamated Investment and Property Company, which went into liquidation in 1976. Prior to the liquidation the Welbeck Estate Securities Group acquired the entire estate comprising 525 houses 15 shops and the Royal Exchange public House in Sale Place. The surrounding area is now known as Merchant Square. A former transshipment facility, the surrounds of the canal basin named Merchant Square have been redeveloped to provide 2,000,000 sq ft (190,000 m2) of offices, homes, shops and leisure facilities. The redeveloped basin has some innovative features including Heatherwicks Rolling Bridge, the Merchant Square Fan Bridge and the Floating Pocket Park. Situated to the north of the railway as it enters Paddington station, and to the south of the Westway flyover and with the canal to the east the former railway goods yard has been developed into a modern complex with wellbeing, leisure, retail and leisure facilities. The public area from the canal to Sheldon Square with the amphitheatre hosts leisure faciliites and special events. A green space and conservation area in the east of the Paddington district immediately to the north of the Westway and west of Edgeware Road. It includes St Mary on Paddington Green Church. The Paddington Green campus of the City of Westminster College is adjacent to the Green. Paddington Green Police Station is immediately to the north west of the intersection of Westway and Edgeware Road. Paddington lies within the Transport for London (TfL) area and has the usually array of taxi, bus, rail and bicycle facilities associated with a central London area. The east of the district is bounded by the A5 (Edgware Road) which also is a main route out for connections to the North Circular Road and M1 motorway at Staples Corner. The Marylebone flyover carries the A40 trunk road over Edgware Road and thereafter continues as the elevated Westway towards the M40 motorway through the north of the district. 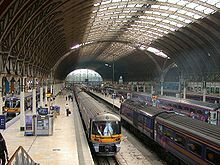 Paddington station is the terminus for mainline and regional services towards the West Country and South Wales. As well as the Heathrow Express premium service it is also the London terminus for ferry connections to south east Ireland via Rosslare Europort. The station provides commuter services to the west of london and Heathrow and should be supplemented by Elizabeth line (Crossrail) services which are expected to open in stages from May 2018. The district has two London Underground stations: one on Praed Street served by the Bakerloo, Circle and District lines and one at Paddington Basin served by the Circle and Hammersmith & City lines. Commercial traffic on the Grand Junction Canal (which became the Grand Union Canal in 1929) dwindled because of railway competition in the late-19th and early-20th centuries, and freight then moved from rail to road after World War II, leading to the abandonment of the goods yards in the early 1980s. The land lay derelict until the Paddington Waterside Partnership was established in 1998 to co-ordinate the regeneration of the area between the Westway, Praed Street and Westbourne Terrace. This includes major developments on the goods yard site (now branded Paddington Central) and around the canal (Paddington Basin). As of October 2017[update] much of these developments have been completed and are in use. PaddingtonNow BID put forward a renewal bid in 2017 covering the period April 2018 to March 2023, which would be supported by a levy on local businesses. Development schemes for St. Mary's Hospital and Paddington Square are likely to commence in this period, and the impact of the opening of the Elizabeth line in 2018 would be soon felt. Paddington has a number of Anglican churches, including St James's, St Mary Magdalene and St Peter's. In addition, there is a large Muslim population in and around Paddington. Between 1805 and 1817, the great actress Sarah Siddons lived at Desborough House, (which was demolished before 1853 to make way for the Great Western Railway) and was buried at Paddington Green, near the later graves of the eminent painters Benjamin Haydon and William Collins. :p.183 Her brother Charles Kemble also built a house, Desborough Lodge, in the vicinity—in which she may have lived later. :p.230 In later years, the actress Yootha Joyce, best known for her part in the classic television comedy George and Mildred, lived at 198 Sussex Gardens. The eccentric philanthropist Ann Thwaytes lived at 17 Hyde Park Gardens between 1840 and 1866. The Victorian poet Robert Browning moved from No. 1 Chichester Road to Beauchamp Lodge, 19 Warwick Crescent, in 1862 and lived there until 1887.:pp.199 He is reputed to have named that locality, on the junction of two canals, "Little Venice". But this has been disputed by Lord Kinross in 1966 and more recently by londoncanals.uk who both assert that Lord Byron humorously coined the name. The name is now applied, more loosely, to a longer reach of the canal system. St Mary's Hospital in Praed Street is the site of several notable medical accomplishments. In 1874, C. R. Alder Wright synthesised heroin (diacetylmorphine). Also there, in 1928, Sir Alexander Fleming first isolated penicillin, earning the award of a Nobel Prize. The hospital has an Alexander Fleming Laboratory Museum where visitors can see Fleming's laboratory, restored to its 1928 condition, and explore the story of Fleming and the discovery and development of penicillin through displays and video. British painter Lucian Freud had his studio in Paddington, first at Delamere Terrace from 1943 to 1962, and then at 124 Clarendon Crescent from 1962 to 1977. For education in Paddington, see List of schools in the City of Westminster. Paddington in the 17th century is one of the settings in the fiction-based-on-fact novel A Spurious Brood, which tells the story of Katherine More, whose children were transported to America on board the Pilgrim Fathers' ship, the Mayflower. Timothy Forsyte of John Galsworthy's The Forsyte Saga and other relatives resided in Bayswater Road. Paddington Bear, from "deepest, darkest Peru", emigrated to England via Paddington station. The films The Blue Lamp (1950) and Never Let Go (1960) depict many Paddington streets, which suffered bombing in World War II and were subsequently demolished in the early 1960s to make way for the Westway elevated road and the Warwick Estate housing redevelopment. ^ Holbein's Miniature of Jane Pemberton – a further note. Author: Lorne Campbell. Source: The Burlington Magazine, Vol. 132, No. 1044 (Mar. 1990), pp. 213–214. ^ Noorthouck, J., A New History of London 1773; Online edition sponsored by Centre for Metropolitan History: (Book 2, Ch. 1: Situation and general view of London) Date accessed: 6 July 2009. ^ Walford, Edward. "Tyburn and Tyburnia". Old and New London: Volume 5. British History Online. Retrieved 27 September 2013. ^ Brewer, E. Cobham. "Brewer's Dictionary of Phrase and Fable (1898)". Bartleby.com. Retrieved 27 September 2013. ^ a b "Letter to the Daily Telegraph". London Canals. 1966. Archived from the original on 2 February 2017. Retrieved 1 October 2017. ^ "Paddington Basin / Merchant Square". Paddington Waterside Partnership. Archived from the original on 19 July 2011. Retrieved 1 October 2017. ^ "Paddington Water Taxi service launched". The Paddington Partnership. 6 June 2017. Retrieved 1 October 2017. ^ "Explore Paddington Central". British Land. Retrieved 2 October 2017. ^ "Events". British Land. Retrieved 2 October 2017. ^ "Elizabeth line - Countdown to Launch". Transport for London. Archived from the original on 30 September 2017. Retrieved 30 September 2017. ^ a b "Paddington Renewal Proposal 2018-2013" (PDF). PaddingtonNow. 2017. Retrieved 2 October 2017. ^ "Bellator 144: Michael Page aiming to be the new face of mixed martial arts in the UK". The Daily Telegraph. 23 October 2015. ^ From differences in the following two sources, it may be inferred that Mrs Siddons lived in Desborough House, not Desborough Lodge. The former was destroyed before 1853, the latter a few years later when Cirencester and Woodchester streets were built. ^ Friends of Broadwater and Worthing Cemetery: Broadsheet, Issue 10, Spring 2011 "Ann Thwaytes" by Rosemeary Pearson, p.11. Wikivoyage has a travel guide for Paddington - Maida Vale. This page was last edited on 2 April 2019, at 14:07 (UTC).